Economic View: What if a Recovery Is All in Your Head? Beyond fiscal stimulus and government bailouts, the economic recovery that appears under way may be based on little more than self-fulfilling prophecy. Consider this possibility: after all these months, people start to think it’s time for the recession to end. The very thought begins to renew confidence, and some people start spending again — in turn, generating visible signs of recovery. This may seem absurd, and is rarely mentioned as an explanation for mass behavior late in a recession, but economic theorists have long been fascinated by such a possibility. The notion isn’t as farfetched as it may appear. As we all know, recessions generally last no more than a couple of years. The current recession began in December 2007, according to the National Bureau of Economic Research, so it is almost two years old. According to the standard schedule, we’re due for recovery. Given this knowledge, the mere passage of time may spur our confidence, though no formal statistical analysis can prove it. The International Monetary Fund’s October World Economic Outlook proclaimed that, “Strong public policies have fostered a rebound of industrial production, world trade, and retail sales.” The IMF, along with many national leaders, seem ready to give full credit to these policies for engineering what might be the end of the global economic recession. National leaders and international organizations do deserve substantial credit for what has been done to bring about signs of recovery since the spring. The international coordination of world economic policies, as formalized in the recent G-20 statement, is unprecedented in history. But one also suspects that world leaders have been too quick to claim so much credit for their policies. After all, recessions generally tend to come to an end on their own, even before there were government stabilization policies. For example, in the United States, the recessions of 1857-8, 1860-61, 1865-7, 1882-85, 1887-88, 1890-91, 1893-94, 1895-97, 1899-1900, 1902-04, 1907-8, and 1910-12 all ended without help from the Federal Reserve, which opened its doors only in 1914. Decades of economic research have assumed people pursue their goals in a rational manner, discounting the effects of emotion, bias, error, and other irrational forces. Robert Shiller argues that economists need to take a closer look at how people make decisions. Q: How important is it to understand what people are thinking and feeling when you are trying to understand the economy as a whole? That's been a controversial question in economics for a long time. Milton Friedman wrote a collection of essays in 1953 called Essays in Positive Economics, in which he argued that you shouldn't try to infer what people are thinking because people really can't tell you what they're thinking. If you ask people why they did something, they will give you a conventional answer or mislead you. 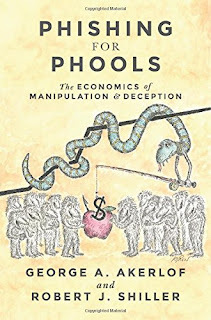 The idea was that the essence of economics is to look at the constraints that people have and assume that people are behaving rationally, subject to those constraints, and interpret economic data as reflecting that rational behavior. That is the defining characteristic of economics as a discipline — as opposed to psychology as a discipline — that, in understanding something as massive as the economy, it's best to look at people's actions, not their ostensible reasons. There is some appeal to that. I just wish it were more right. I can get enthusiastic talking about this theory because, in some respects, it is good. To give an example, suppose you are trying to understand the seasonality of food prices — why they go up in the winter and down in the summer. Well, it's pretty obvious that it has something to do with the weather as a constraint, but you better think it through, because we live in a global economy, and when it's winter up here, it's summer down south. Obviously they'll ship food from one hemisphere to another. That puts a limit on seasonality. This is pure economics, and I'm sure it's right, because the seasons occur year after year after year, and you have people whose job is to ship fruits and vegetables and food around. They're going to find the best pattern of shipping, given all the costs. It wouldn't make a lot of sense to ignore that. Thinking that people get emotional in the summer, or something like that, would probably be wrong.